Description: Covering four municipalities, Mt. Matutum is a major watershed that supplies 25% of the water requirement of the SOCCSKSARGEN area. It is also home to various rare endemic birds and mammals, but destructive and unsustainable human activities, along socio-political influences are placing a heavy strain on the natural resources of the Mt. Matutum Protected Landscape. 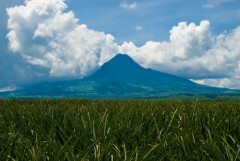 Matutum is a landmark of the SOCSARGEN Growth Area and the headwater of five major rivers. Covering four municipalities, it is a major watershed that supplies 25% of the water requirements of SOCSARGEN. Matutum is home yo some rare endemic birds, like the Mindanao Lorikeet (Trichoglossus johnstoniae), Mindanao Bleeding-heart (Gallicolumba criniger), and the Mindanao Broadbill (Eurylaimus steerii), to name a few.